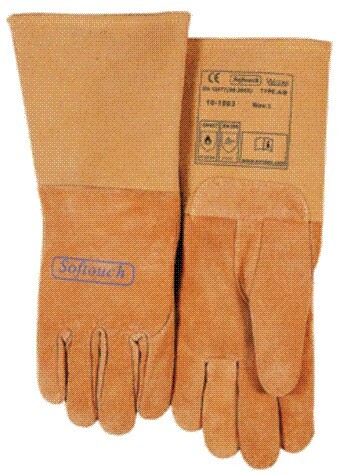 SOFTouch™ top grain reverse pigskin welding glove with reinforced thumb. Seamless index finger for better feed of TIG wires. Weldas® TIG gloves have a “seamless” index finger construction. This provides unobstructed control over small diameter welding rods and ultra light TIG torches. This design also minimizes the seam burn out and abrasion. - Oil and abrasion resistant - Reversed (suede) grain pig leather - Seamless index finger.